Rowan All Seasons Chunky This yarn although a chunky weight is light enough to wear for any season and shows beautiful stitch definition. 60% Cotton 40% Acrylic. 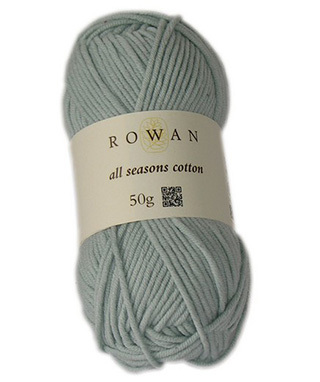 Rowan All Seasons Cotton An aran weight cotton with the softest touch that carries a loftiness in texture and feel. 60% cotton/40% acrylic/microfibre. Rowan Cotton Cashmere A premium blend of 85% cotton and 15% cashmere, which makes the knitted fabric light to wear and soft to the touch. A wide pallet of 16 shades, from tonal light shades through to the darker pallet with pops of colour, this yarn is ideal for Summer knits with a touch of luxury. 85% Cotton 15% Cashmere. Machine Wash 30 deg C.
A mercerised 100% cotton which sits between the dk and 4 ply weights making it lighter to wear and to handle. Rowan Cotton Lustre SALE 20% OFF! An interesting blend of Cotton, Linen and Modal which gives it a wonderful drape with a soft handle. This yarn en-corporates the essential summer shades and knits on 6mm needles making it perfect for a quick summer knits. The colour palette en-corporates the essential summer shades. 55% cotton, 35% modal, 10% linen. Machine washable at 30 C.
Rowan Denim Lace A lace weight yarn ideal for texture and lace stitches and can be knitted with Rowan other lace weight yarns. Originally soured from recycled denim this yarn is 95% cotton and 5% other fibre, this is the vintage denim from the recycling process spun and transformed into yarn. Available in 6 shades from denim blue, to neutral. 95% Cotton 5% Other Fibre. Hand wash.
Rowan Denim Revive NEW YARN! Made in Italy using recycled denim and recycled cotton. Originally sourced from recycled denim this yarn is 95% cotton and 5% other fibre, this is the vintage denim from the recycling process spun and transformed into yarn. Hand wash.
Rowan Handknit DK Cotton A DK weight in soft 100% pure cotton. Handknit cotton made with combed cotton. 100% cotton. 50g balls. Machine wash 40 deg. Rowan Mako Cotton A very fine cotton spun from extra-long staple Egyptian fibre. This premium cotton fibre is then blended with Lyocell (a natural plant fibre source) creating a modern yarn, ideal for Athleisure. Has natural elasticity in it’s tube like structure, allowing the knitting to move with the wearer. 63% Cotton 37% Lyrocell. Hand wash.
Rowan Milk Cotton DK Beautifully soft cotton blend. 70% Cotton, 30% milk protein. Cold wool cycle. Rowan Original Denim Knits to Rowan Denim Indigo Dye Cotton DK. A practical and hard wearing yarn. Rowan Original Denim is a 100% pure cotton. It is important that you use a Rowan Denim pattern, where allowances have been made for shrinkage. Because the dye is only surface dye, during knitting the colour will come off onto your hands. Rowan Denim, as with other indigo dye textiles, fades and ages with washing and wearing. Most of the colour loss takes place during the first wash when all the loose dye is washed out exposing the core. The knitted pieces will also shrink in length during the first wash. This tightens the knitting adding emphasis to cables and texture giving the finished garment its unique look. Machine washable at 60 C.
Rowan Purelife Organic Cotton DK Naturally Dyed Eco-responsible organically grown, coloured with plant dyes.100% Organic Cotton. Rowan Purelife Organic Cotton 4ply Naturally Dyed Eco-responsible organically grown, coloured with plant dyes.100% Organic Cotton. Rowan Silky Lace NEW YARN! Made in Italy using cotton and Mulberry silk. Pure white in color and made up of individual long fibers, Mulberry silk is more refined than other silks and some of the finest available in the world. One of the unique benefits of Mulberry silk is that it is 100% natural, odorless, hypoallergenic and contains a natural protein that reduces the possibility of an allergic reaction. 65% Cotton 35% Silk. 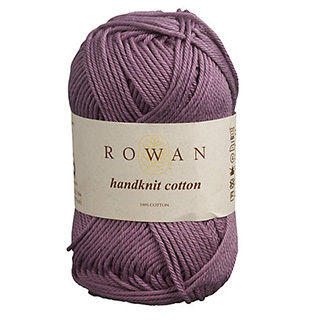 Hand wash.
Rowan Softknit Cotton SALE 30% OFF! A wonderful cotton drape yarn which shows texture and cables detail. Softknit Cotton is also interchangeable with Handknit Cotton. 92% Cotton/8% Polyamide. 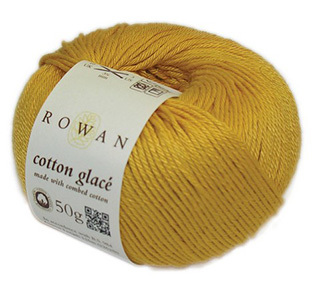 Rowan Softyak DK A blend of 15% yak, 76% cotton, 9% nylon and is a DK weight giving knitters the best of all possible worlds, the softness of cashmere – with less of the price tag – plus added durability and washability. The blend of Cotton and Yak hair gives a pretty melange effect as the Yak is a dark fibre and absorbs the colour differently to the Cotton. Machine washable at 30 C.
Rowan Stone Washed 100% cotton. 50g doughnut balls. Hand wash.
Rowan Summerlite 4ply Made using 100% of the finest Cotton resulting in a beautiful soft matt cotton, with a wonderful summer tonal colour palette. Machine washable at 30 C.
Rowan Summerlite DK The natural next step from our popular Summerlite 4ply. Beautifully soft and light to wear, made with finest Giza cotton this yarn is soft and tactile with a unique matt look. This yarn is ideal for delicate summer knits and great for crochet. Machine washable at 40 C.
Rowan Tetra Cotton SALE 20% OFF! A unique modern construction of four shades, creating an interesting yet delicate colour palette. Interchangeable with Truesilk and Cotton Glace this yarn has lots of pattern support available. 100% cotton. Machine washable at 30 C.